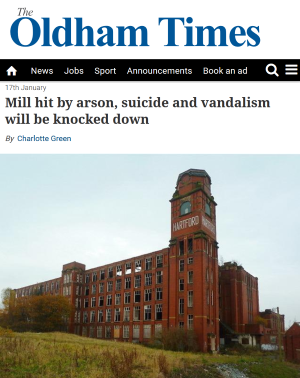 The Oldham Times has reported on how an Oldham Grade II Listed Hartford Mill where there have been 250 emergency incidents in just three years – including arson, serious injury and a suicide – is to be demolished as councillors brand it a ‘death trap’ and reject linked stipulations by Historic England. The Grade II-listed Hartford Mill will be knocked down and replaced by homes under proposals agreed by the borough’s planning committee last night. The Werneth building once stood as an icon to the borough’s industrial heritage, but is now widely regarded as an eyesore and a risk ublic safety. Councillors addressing the meeting said they were losing part of Oldham’s history ‘with regret’, but described it as an ‘environmental time bomb’ which portrayed the town in a bad light. Planning officer Graham Dickman told the committee the building had been vacant since 1991 and had fallen into ‘rack and ruin’ since that day. Members heard there were holes in the corroding concrete floor, a large part of the roof is missing, nearly all the windows have been smashed and the internal beams are no longer supporting the building. Merely making the building wind and watertight would cost around £6 million, they were told. He added the mill currently dominates the skyline of the area as it is prominently viewed from the Freehold tram stop. ‘The negative impact of the mill is not just local to the residents of Werneth and Freehold who have to live in the shadow of the building for over a generation, it also affects the social and economic wellbeing of the borough as a whole,’ Mr Hill said. It is an ‘unwelcome advert of decay for new residents and investors for the town alike’, he concluded. Cllr Shoab Akhtar has been an elected representative for Werneth ward since 2000. Councillors also agreed to abolish a condition of the demolition stipulated by Historic England, which would have meant a detailed planning application would have to be approved before the mill could be knocked down. Mr Hill explained this would make it difficult for the mill owner to find a development partner, as it had been unable to do so for nearly three decades. Chadderton North ward Cllr Barbara Brownridge said the heritage group seemed to be waiting for a ‘mythical application’ to materialise, despite admitting there was no viable use. ‘They’re giving with one hand and snatched it back with the other,’ she said. Conservative Coun John Hudson said it was a ‘tragedy’ the building had been allowed to deteriorate over the last four decades. But he added: ‘The sooner we demolish this the better, it eradicates a lot of problems. I just think it’s sad that it’s got into this state,’ he said. Failsworth Coun Peter Davis, whose mother had worked at the mill during its time as a mail depot order site for Littlewoods, said there was no longer any demand for ‘industrial palaces’ like Hartford Mill. ‘God forbid we have another fatality and we’ve got a duty to get rid of it,’ he added. The mill, which was opened in 1907, produced cotton until the 1950s. In 2014, the mill was hit by a fire that caused considerable damage and a year later a teenager died after falling from the roof. Owners have marketed the site for sale numerous times, but have been unsuccessful. It’s hoped the mill will now be replaced with new homes. The proposals were approved unanimously by councillors.